I REMEMBER THE morning my friend came with all his men. The priest was riding beside him. The sun was low above the trees across the valley and a mist was smoking up around their bare branches. It was going to be a beautiful day, the kind I loved in that place. We never had days quite like those at home. There was still time for the light keepers to witness the early sun as it mingled with the mist and glowed on the trees and the brittle skeletons of frosted grass. Before the funnel started collecting that wonderful light, there was still time to see the river steaming to join the sky. It was after I had called the keepers up to the walls that we saw my friend and his men coming down the track. They rode horses and their pennants drooped in the still morning air. My friend’s armour was newly polished and shone in the low rays of the winter sun. He and his men were wearing a new livery: sable surcoats bearing a silver sword like a cross. He paused for a moment at the gate and saluted me. He always called it that no matter how many times I said it was not its real name. Looking back, I know I saw in his face that his heart was not his own. It was the snake’s beside him. When the priest looked up at me, there was no friendship in his face, only those cold, dark eyes. I had always brushed off his hate before, but that day my heart knew something was wrong. Even as he came through the gates. I went down from the walls to greet my friend. He shook my hand, but did not look me in the eye. And then there was a cry from Tapani who was still on the walls. He said there were more men coming and I looked and saw them. There were hundreds. They came with wagons and horses and lances and armour. They all wore the black livery. I wondered why my friend had brought so many with him. He had never seemed a proud man to have so large an entourage. I went to ask him, but he turned away. Then the priest shouted an order. Iron men gripped my arms and held me. I called out to my friend. I saw men on the walls where Tapani stood. They stabbed him; the first delf blood. I do not know how much more they spilled. I was not there to see that part. I could not stop them. And the dreams came. THE SMELL OF the damp soil filled Nicholas Berwick’s nose. He could feel his heart beating and he took deep regular breaths, trying to stay calm. Somewhere around him, but out of sight, there were others crawling through the long grass with him. He stopped for a moment and listened. He dared not stop long. They were relying on him just as he was on them. No one must be alone up front; that was certain death. A breeze rustled the grass stalks, borne down from the mountains behind to the sea somewhere ahead. The only sound was his own breathing and the gentle hiss of the grass. He peered straight ahead. It was unmistakable. The devils’ tower stood menacing and tall against the unnatural gloom of the sky. 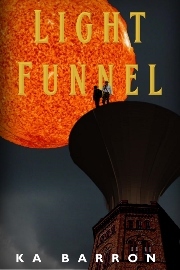 It tapered a little as it went higher, then its top blossomed into the mouth of the funnel, now uselessly open to the sky. There was no sign of life amongst the lower buildings clustered at its base, but he knew the devils were there, waiting for them in the deep shadows of the sunless land. He had seen them before, hurling livid death from their battlements, standing at windows, conjuring up the spirits of Hell as burning furies to kill his friends and comrades in a screaming death. That death could be his soon if he was not watchful, if he did not retreat at the right time. Surely they were close enough? When would the captain blow his whistle? Their orders were to keep crawling until they heard it. They knew how fast to move to keep close together, worming forward on arms, toes and belly. They had practised. He kept moving, elbows digging in, pulling himself along. Then the whistle went. It was the two short blasts to be ready. He slipped the long-arm from his shoulder and licked his dry lips. The long-arm was loaded and ready. Then came the single, longer blast. He raised himself onto one knee, lifting the gun and cocking it in one motion. Other troopers rose out of the grass around him. He picked a window in the tower, squinted along the barrel and fired. As he did so, his comrades’ long-arms went off too. Then they were on their feet and running towards the tower, his fingers winding open the breech on the long-arm to drop in another ball as he went. He paused to tip in the powder and scanned the walls, waiting for the demons to appear, but the night remained darker than night should be under that turgid, unnatural cloud. There was a call from down the line. It passed from man to man until it reached him. Keep moving. How far would they move forward? They had never been so close to the Light Tower as they were now. This was suicidal; the devils were surely luring them in. Then another thought occurred to him. Perhaps they had gone, retreated. Maybe there were no more demons. There was a single blow on the whistle and the lines of men halted. All of them knelt, ready to turn and run. He looked over to where he knew the captain was. It was so dark he could not see any arm movements. Then came a long dipping note on the whistle which ended on a short upward blast. The men around him moved. It was the command to outflank. He was on the right wing and the troopers around him were running again, trying to keep apart from each other to provide smaller targets as they looped to the side of the tower. He knew the left flank would be doing the same thing. He wished he was in the centre. They would be staying where they were, directly in front, with a slightly shorter run to their lines and cover. But even a little shorter could make all the difference if you needed to outrun a demon. They were looking for the gate, the single way into the tower. One of the troopers next to him was carrying a bomb over his shoulder. He would never have expected to have a chance to use it. Berwick was relieved he did not have that extra weight. He searched each of the windows nervously. Suddenly there were flashes and gunshots from the walls. So the devils were there after all, but it was dark and Berwick and his comrades were running targets and hard to hit. “Look!” came a shout. Then he saw the glow from a mid-level window in the tower. He felt a sudden chill, then saw almost with relief, that it was a fiery bolt. The crossbow bolt fell harmlessly into the grass. Two more followed. There was a cry to his right. Someone was hit. For a moment he was in two minds. Should he help his fallen comrade? The fire had caught on his clothing. The man was calling now, frantic. Berwick realised he could see better. The still burning bolts had provided some substance to the night. The attacking men had more shape now, which meant they were much easier to see. The gunfire and crossbow bolts began again from the walls. Now was the time to return fire. They might not hit anything, but they hoped it would keep the devils back until they were at the gate. There was a fusillade of shots from the first rank. They had become mixed up as they ran, but they knew their role. As they reloaded, the second rank fired, then the third. Meanwhile the bombardier kept running for the gate. The rolling volleys were doing their work, their closer range made them more effective. The fire from the devils’ tower had reduced. It is hard to stand at an open window when men are shooting at it. Even the devils feared that. There was another glow, this time from the funnel tower. The soldiers did not need to be told. They were already scattering. The demons were coming. Berwick did not look back. He neither needed nor wanted to see it swooping down at him. The hairs on the back of his neck were up and he was running for his life. There was light now, like the golden light of a setting sun as it dropped below the last of the cloud. The seed heads in the grass glowed red. He had two shadows. There were two demons. One of the shadows tipped around to his left, but the other stayed in direct alignment with him and the tower. He did not turn, but he could tell there must be a demon going for each of the flanking parties. His second shadow went suddenly long. The demon had dived. There was a scream, but it was instantly cut short by an explosion. For a few seconds a new light was added to the night. That was one of the bombs. A bombardier was dead. Both shadows wavered, but the one he cared about most stayed long. The demon was still coming, unscathed by the explosion. It was hunting down more prey. There was another scream and it blended with another. The light behind him felt brighter now. There must have been two men too close together. Others were around him. There were more gunshots, this time from the ground. Someone was not yet running. The first shadow stopped moving. The centre must have stayed to shoot at the sorcerer. They knew that those who raised a demon had to be able to see it to control it. That was the devils’ weakness and that was what some of the troopers were bravely trying to exploit. The angle on the second shadow changed abruptly. The demon pursuing them had changed direction. It was heading for the centre. This was their chance. At that moment he did not think that this chance came at the expense of other men, of some of his friends. That would come later. At that moment he just knew he had a reprieve, for how long he did not know. He found new energy and ran on. He heard the screaming begin behind, while around him, he was aware of men running. They all felt the same. There was no shame in running from a demon. You could not fight a demon, only kill the sorcerer. He could see the earth rampart of his own lines now, the wall they had dug out of range of weapons to provide cover from a sorcerer’s guiding eyes. The first shadow simply moved with him, but the second was shifting again. It had finished its feast, there was no more time now, he simply had to race it to the rampart. He had made this run before, but it had never been so long. They had never been as close to the tower as they were that night. He could see the brightness growing as the demon gained on them. They were so fast. How much further now, he wondered, perhaps a hundred yards. It was so far. Then the light began to fade. Eighty yards. It was dimming. Sixty yards. The demon was fading, he knew it. He risked a look over his shoulder in time to see the last light of the demons wink out. Forty yards. Surely he was safe now. The rampart came up to him and hurled himself through the canvas gate. Arms grabbed him, slapped his back. There was not the usual joking. They were counting the men in. They were waiting for the captain and the men from the centre. None returned. Berwick was still catching his breath sprawled on the ground when the scarred face of Lord Lyell’s constable leaned over him. He put out a calloused hand and hauled the trooper to his feet. A few minutes later, Berwick was standing in Lord Lyell’s tent with another trooper called Clune. He had expected there to be more inside it than there was. In front of them, the Lords Lyell and Walter and their constables sat on simple folding chairs. There was a map unrolled on a small table behind them and a low cot in each corner. With the captain of the attack presumed dead, the two soldiers had recounted what had happened in front of the light tower. As the four commanders turned to each other to confer, the light of a torch on either side of the tent cast shifting shadows on the canvas stirring in the night breeze. “It was only a matter of time before the devils realised what we were doing,” said Lord Walter, his lean, aged face frowning under still thick grey hair. “Aye, they be conserving their light. It sounds as though they only used it when they thought we were too close to the gate,” said his constable. The two men were similar in age and Berwick guessed they had fought together for years. Lord Lyell was resting his square head on one of his large fists, leaning forward in his chair. He nodded, but said nothing. “They killed one of the sorcerers!” Lord Walter exclaimed. “Or wounded it,” said Lyell’s constable. He was a stocky man with a scar down one side of his face from forehead to chin. He turned again to the soldiers. As Berwick and Clune turned to leave, their leaders continued the conversation behind them. Then they were out of the tent and amongst the sounds of the camp once more. Berwick looked at Clune who merely shrugged. Berwick took a deep breath and realised he too had a great desire to eat and perhaps the quartermaster would let them have some rum too. More than a week went by. The soldiers had tried some further probing raids, but only managed to raise a demon on one occasion. Berwick and Clune were standing on the beaten earth firestep, resting their chins on the top of the rampart and looking across into the land of their enemy. Behind them, a raiding party was waiting quietly for the order to advance. Berwick could not help but look at them. He felt it must be like looking at himself, he had been in that position so many times. Today was not his turn. Today was his turn to watch others. Most of the faces were blank. Some muttered jokes to each other and only a few looked afraid. He wondered what he looked like when he was waiting to fight. “They must have good eyes, Nick,” said Clune. He was looking away to the right. There was a call from behind. The waiting soldiers stiffened then began to file out through the canvas gate in the earth wall. As more and more men came from behind the nearest tents, Berwick realised there were at least twice as many men as in a usual raiding party. They turned their heads to the left. Eastwards, the land rose gradually. Somewhere out of sight was another light tower. The raiders went out bent and when they reached the agreed point, all began to crawl. Others were at the wall now. Most were watching their comrades crawling towards the light tower. Berwick and Clune were looking up and down the line. “I thought I saw something then,” said Berwick. It was miles away, but there was a darker patch on the land. If they watched it long enough, it appeared to be moving. “It be going into Metsakant. Be they ours?” Berwick asked. Clune shrugged and kept looking. “I think they be trying to break through between the towers,” Berwick added. “But if we can see them, so can the devils,” said Clune. Even as he spoke, they caught the brightness out of the corner of their eyes and turned towards the light tower across the dead ground. It was too far away to see clearly, but a demon was rising from the tower. For a moment it hung in the air, then it shot off toward the eastward horizon. They watched it go, heading towards the darker patch. The demon became nothing more than a speck, a distant star fallen to the grey earth. As it did, there was a burst of gunfire from in front of them as the raiding party opened up. With still no demon flying at them, the raiding party kept moving forward, firing as it went. After a few minutes, another demon emerged from the light tower. The gunfire seemed to falter, but the second demon followed the first and the volleys continued. “It be an attack across the whole front!” said Berwick with excitement. “Look, their lordships be looking the other way now,” said Clune. They looked back at the tower and once more a fiery light formed in the air outside the tower, hovered for a moment, then sped towards the west. Another appeared in the distance before it arrived. “This be not going well,” said Clune. “Then there be something we don’t understand,” Berwick replied. Looking at Lord Walter and Lord Lyell, the two men appeared to be congratulating each other.